Like with almost all other products, shopping for a new rug online is a convenient way to research and see different rugs rather than traipsing around various stores. While you can’t see or touch the rug in person, you can do as much research as you need, read reviews and compare different options. Some websites even have information about the origin or history of the rug which may be of interest to you, plus you can thoroughly check sizes and materials before making a decision. They fill empty space on otherwise plain wooden, concrete or tile floors. They give warmth and comfort on cold floors. They brighten up a room or add a new dimension to your décor. ​How Do I Choose the Right Rug? Size: The size of a rug is one of the most important factors. A rug that is too big and almost takes up the whole floor space of a room doesn’t look good, and a rug that is too small will look weird as well. When a rug is being placed under furniture, you should always allow for free rug space past the edges of your furniture. Pattern: A timeless pattern such as those used in vintage or traditional rugs are a great investment if you want something that you can pass down through the family, but these don’t always look good in a modern home. Simplistic décor incorporates modern rugs best but do be aware that they could go out of style at some point. Color: The great thing about many traditional, Persian or Oriental rugs is that they use many different colors so you can always find something to blend in well with your décor or that contrasts well. Make sure the colors don’t clash with your furniture though. If you have no idea where to start, try looking at pictures of rugs in different kinds of rooms or look at friends’ homes for tips on what looks good and what doesn’t. Room and placement: Depending on where your rug is going to sit, you may like to choose a different thickness. If a rug is going to be walked on or even sat on a lot, choosing a spongier, comfortable rug is a wise decision. If the rug is going in a room where it will not be touched at all, then you could go with a thinner and flatter option. ​Even though you are purchasing online, there are manufacturers and galleries who have a reputation for producing good quality rugs and will offer friendly advice to help you make the right choice. Our favorite online rug retailer is ECarpetGallery who sell affordable luxury rugs to millions of customers around the world. Excellent customer service right from selecting a rug through to purchasing. Free shipping to continental USA and Canada. Frequent sales + clearance items. The ECarpetGallery website is extremely easy to follow and use. 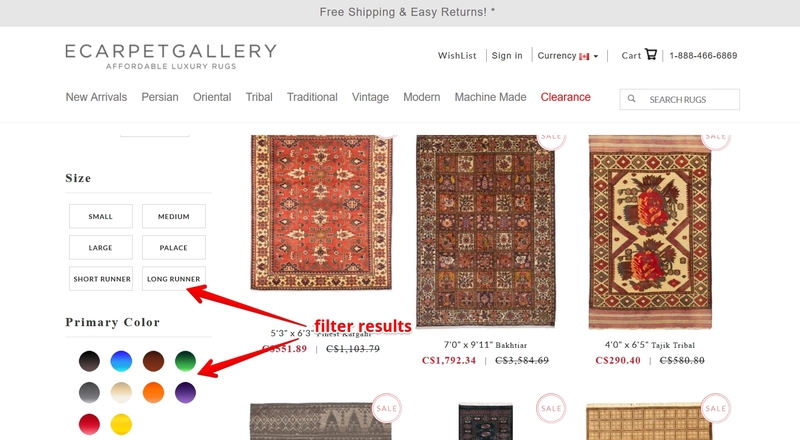 There is a main menu at the top of the page which shows the different categories of rugs that they sell. Each page is laid out well with the sizes and price of each rug clear to see, plus the ability to filter search results. Once you click on a rug you like the look of, you are presented with a ton of information including the specific colors, material, shape, and style. Most rugs have a blurb about the rug and its origins, which can be particularly useful when buying a Persian or Tribal rug and you want to share the history with your friends and family. You can also find guides on choosing a new rug on the website, plus a great care guide on how to look after it once you have it in your home. ​What Kinds of Rugs do They Sell? 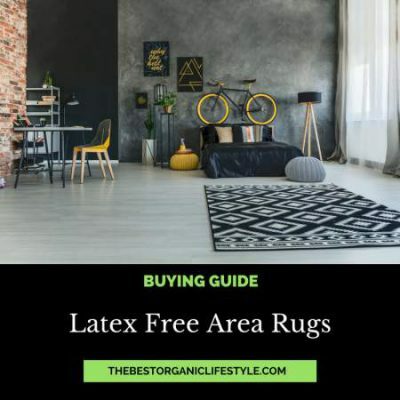 ECarpetGallery group their vast collection of thousands of rugs into seven categories so you can quickly navigate to the style that you have in mind. Persian: Persian rugs stem from Persian and Iranian culture and they stand out by the elaborateness of their designs. They are made in Iran. Oriental: Oriental rugs are handmade in countries such as China, India, Nepal and Turkey. They are called oriental not because of where they come from, but how they are made. Tribal: Tribal rugs are woven by nomadic tribal members on portable looms in different countries. Traditional: Traditional rugs are used in large spaces such as dining rooms or living rooms and are placed underneath furniture. Vintage: Vintage rugs were usually produced in the first half of the previous century and due to their expert craftmanship, are still in excellent condition today. Modern: Modern rugs have the latest in designs or a contemporary look to them. This kind of rug is aimed at a modern home or office. Machine made: Rugs made on a power loom rather than by hand are a cheaper alternative if a handmade rug is out of your budget. ​How Should I Care for a New Rug? 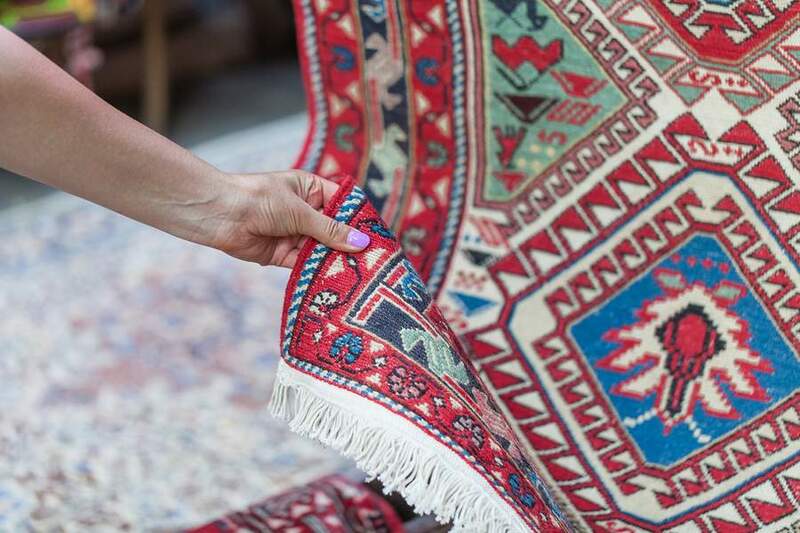 To keep your new rug looking new, it is important to take care of it correctly. 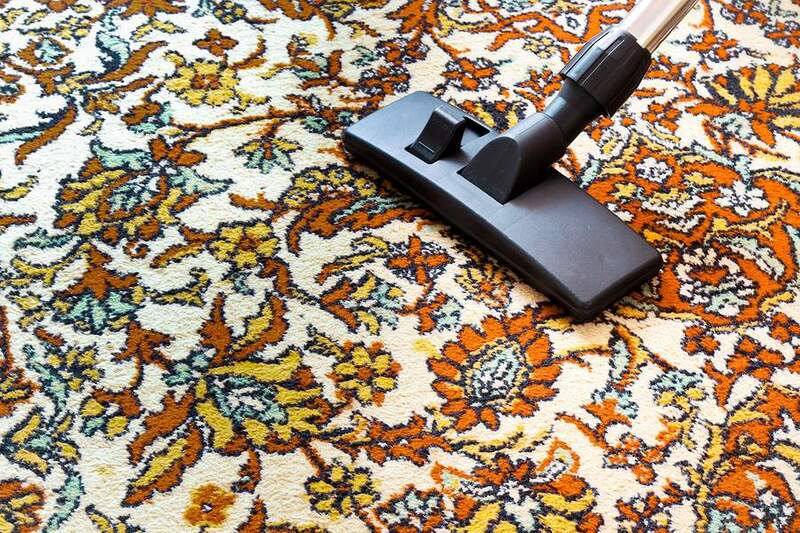 Consider using a rug pad, which will prevent your rug from slipping and wear and tear. Always spot clean any spills immediately before trying other cleaning methods. 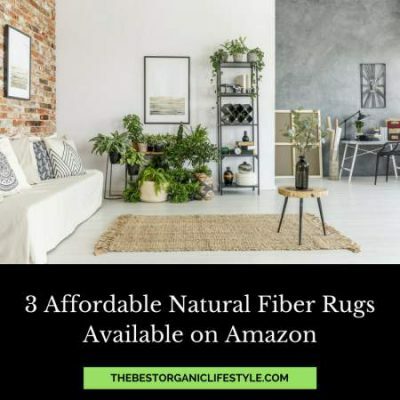 Making a large purchase without seeing the rug in person can be a bit nerve wracking for some, but you can put your mind at ease by using a reputable online retailer such as ECarpetGallery. The site is simple to use, and you can browse through thousands of different designs, colors, and sizes at your own pace without a sales person breathing down your neck. You instantly have access to styles that you may not otherwise find in a retail store, and you can quickly find out all the information you need to know. ​Shop E Carpet Gallery Now! The best thing about buying a rug online is that you don’t have to make a decision straight away. Since you can save your favorite rugs in your WishList, you can take a few days to decide what is right for your home. 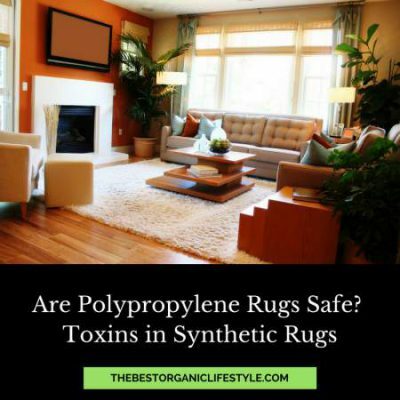 Have you purchased a rug online before? Would love to hear your experiences in the comments below! 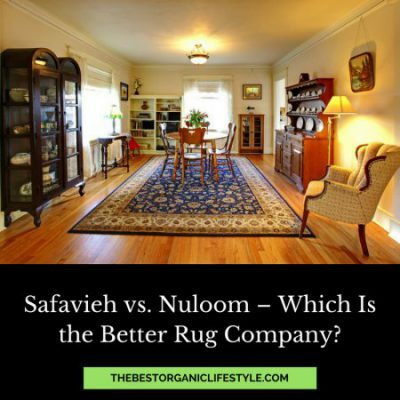 Safavieh vs. Nuloom – Which Is the Better Rug Company?